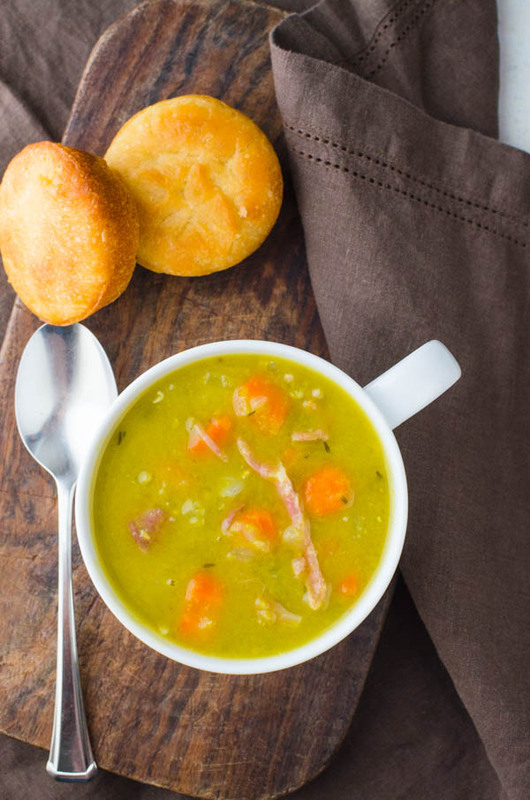 If you love homemade split pea soup, this split pea soup recipe will be your new favorite. 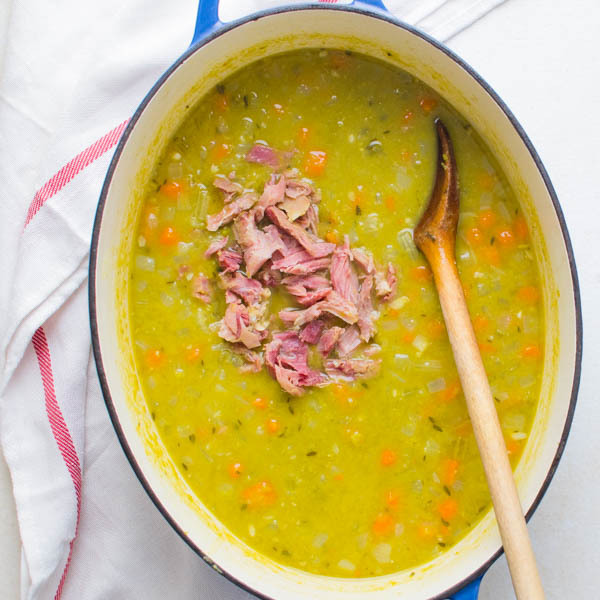 Ham Bone Split Pea Soup uses a handful of fresh vegetables and a leftover ham bone for a whole pot of easy split pea soup that’s ready in just over an hour. This post has been updated for recipe and photos. I had misgivings about putting this green pea soup recipe on the blog. Not because of any flavor issues — but let’s face it — homemade split pea soup — that particular shade of green — doesn’t inspire you to devour bowl after bowl. No, really it’s the aroma that gets you and keeps you coming back. And of course, the taste! This ham bone split pea soup is the way my Mom makes it. So everyone put on your rose colored glasses and go with me on this. Homemade split pea soup is one of the homiest one-pot meals out there. 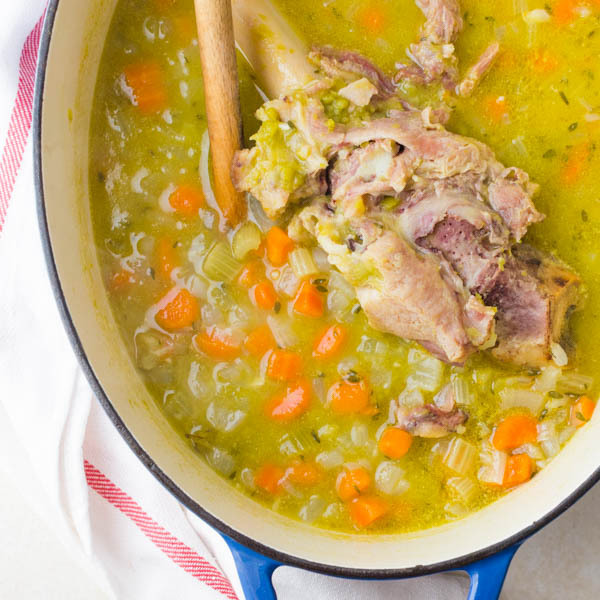 Yes, chicken soup is good for the soul, but ham bone split pea soup in it is good for everything else. This green pea soup recipe is one of those stick-to-your-ribs wonders that’s rich and satisfying — warming you from the inside out. Plus, easy split pea soup goes great with a grilled cheese sandwich, or if you happen to have any of those angel flake biscuits left-over from the holidays, break them out, now! My green pea soup recipe is easy to make and — it makes a lot! This meaty potage gets it’s creamy mouth-feel from those little split peas, which just dissolve into the broth. And by broth, I mean the ham bone and water. Split peas and lentils are the two legumes that don’t actually need an overnight soak or extensive cooking times, consequently, I always have a bag of each on hand for quick, easy, satisfying meals. The key to ham bone split pea soup is the ham bone. It flavors the broth and provides body and mouth feel to the soup. As the ham bone simmers with the other ingredients, it releases natural gelatins that turns this soup into a jello-mold if you chill it overnight in the fridge. You know what I’m talking about. But just heat it up and it returns to that thick, savory amalgam. Man, is it good. 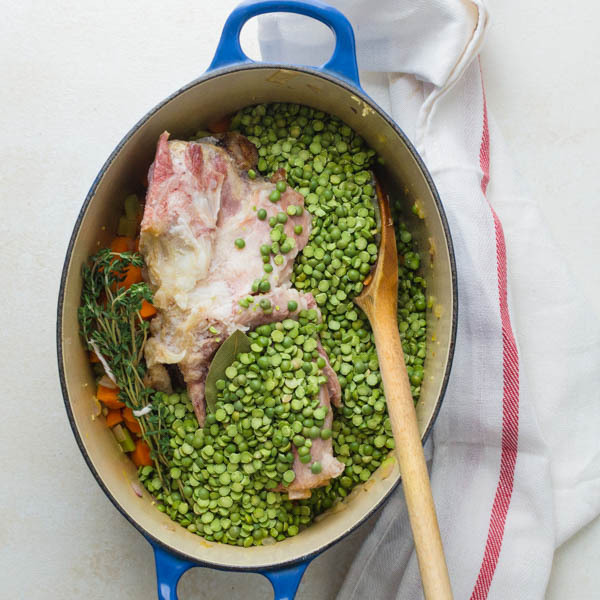 Ham bone split pea soup is so good, you’re gonna want to make a baked ham, just so you can use the bone for a homemade split pea soup. 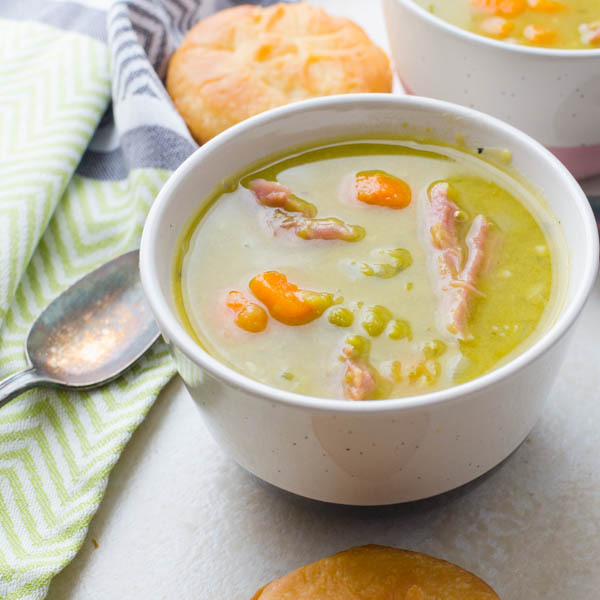 Split pea soup with ham is one of the easiest and most delicious, satisfying soups. A ham bone is essential for flavoring the broth. In a large dutch oven, heat olive oil over medium heat. Add carrots, onion, and celery. Saute for five minutes until vegetables are tender. 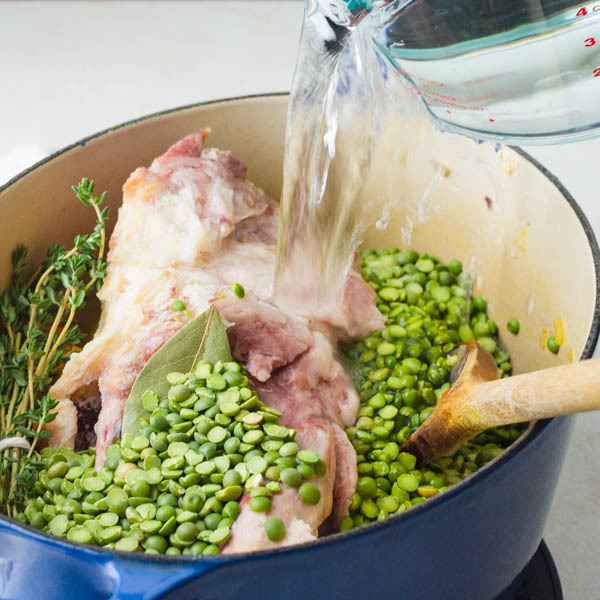 Add the ham bone, peas, water, thyme and bay leaf. Stir and cover. Heat to a boil and reduce heat to medium low. Simmer for one hour or until peas have broken apart and soup is thick. Remove ham bone and discard. Stir in diced ham and heat through. Soup should be thick, but if it becomes so thick that it's more like a split pea scoop instead of soup -- just stir in more water about a cup at a time to thin it out to your liking. Pin “Ham Bone Split Pea Soup” for Later! Lisa, WOW! so simple, yet SO tasty! This is fantastic, yum. Thanks for the recipe. The best things tend to be the simplest! I just made it tonight & it was very good. We are having a very windy, raining night so it was perfect. That’s the perfect weather for this kind of soup! Do you have to steep peas before hand? No, you don’t. The peas are so small that they’ll cook in no time, so no need to pre-soak. Sounds delicious, Kendra! I hope you and your family enjoy it! I’m making this tomorrow, can’t wait. Thank goodness I have a ham bone in freezer and veggies in refrigerator. I’ll let you know the results. Enjoy it Betty! One of our favorites! A delicious recipe that needs a little more time than recommended. I like a thicker pea soup. If you like it thicker, you can also cut back slightly on the liquid added… but beware — if you don’t add enough you’ll have split pea SCOOP! Added carrots and minced garlic. And some salt. Also used a quart of chicken broth and 2 c. water. Can’t wait to see how this comes out! What about using chicken broth as part of the liquid, like half water, half chicken broth. Wondering if it would add to the flavor or take away from it. Also, I want to make this soup right now without going to the market. I have everything but the thyme sprigs. Instead I have a bottle of organic thyme leaves. Do you think thyme leaves (bottle of spices, dried thyme leaves) would work? If so, how many teaspoon/tablespoons of thyme leaves do you think would be the equivalent? Hi Dano. You could use half water and chicken broth — but if you have a ham bone, that’s where the flavor will come from. You can also use dried thyme — I would think about 1/2 teaspoon would be the right amount. Great recipe. I did make a few additions. I cooked a couple of small, diced potatoes and added those at the end. I also added a teaspoon of lemon juice and curry powder. Nothing wrong with this recipe , just some options. Very nice additions, Mary! Thanks for sharing! I love the simple ingredients you use as some recipes call for too much. Was looking for a longer “slow cooked crock pot recipe”. as my neighbor swears by the method to bring out more flavor, but she doesn’t like celery and I do, which you include. Wondering about the best way to adapt your recipe to a longer cook time? Any thoughts on this would be appreciated. Soup looks great! Hi Stan! So glad you like this soup. You can absolutely do this soup in a crock pot. Just sauté the veg in a skillet first and then add all the ingredients to your crock pot. Put it on low for 4-6 hours. If it thickens too much add water about 1/2 a cup at a time. Season to taste with salt and pepper. The problem with this recipe, is it’s a bit of a risk putting the ham bone in at the same time as when you’re cooking the soup. It’s better to boil the ham bone alone in water and perhaps seasonings and let it boil down into stock first before using it to make the soup. That gives your bone and meat a chance to separate apart, including all the bits of gristle and fat, so that all you’re eventually using in your soup is the meat, and then re-add the bone by itself when you start boiling the stock again to cook the soup. Also, let the stock sit in the cold for a while, so any melted fat and other contents can solidify on the top of your liquid, so it can be easily removed. Makes for a healthier soup! That sounds like a really good idea, too. Will have to try that with my next ham bone! Thanks for the tip! Yum! What a perfect meal on a cold fall evening! That ham bone add so much flavor! What a great idea! Can’t wait for cooler weather. 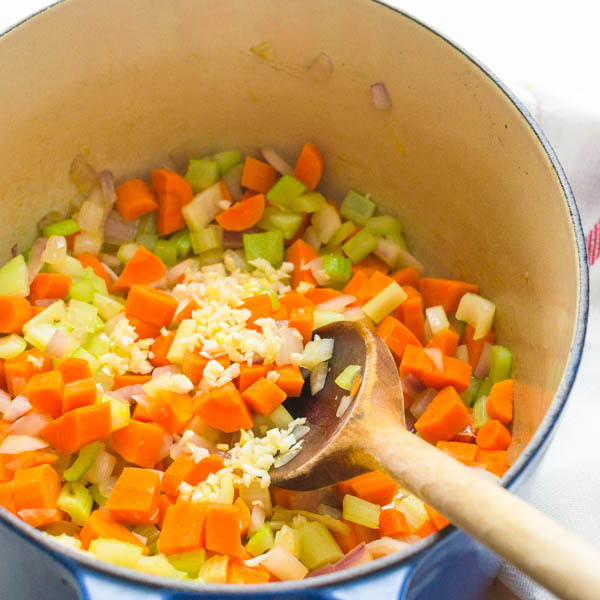 I love all the veggies in this soup – Delish! Tis the season for amazing soul warming soup! This split pea soup sounds delicious! I am going to surprise my mom and make it for her this weekend! Using the whole bone adds so much more flavor to this soup – it’s so delicious!! This looks perfect! I’m such a big fan of simple, healthy, winter soups! My granddaughter and great granddaughter love this. The baby asks me to fix it all the time. It is delicious. I’m glad to know they enjoy it, Vicki! Split pea is always a favorite in my family too! Made this today and I can honestly say it was delicious! Thanks Lisa, keep ’em coming! I love split pea and ham soup. This is such a perfect and comforting recipe for the rainy weather right now – thanks for sharing it! It’s simple, but delicious. Thanks, Thalia!